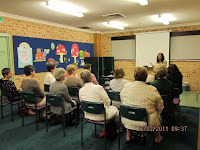 It’s Oscars time and an enthusiastic group of movie buffs met at Engadine Library on Tuesday, February 15 for the premiere gathering of our Film Discussion Group. The film screened was “Evelyn”, a David and Goliath story set in 1950’s Ireland, a cross between “Angela’s Ashes” and “The Castle”. After viewing the film, a lively discussion followed over a reviving cup of tea or coffee. Keeping the movie under wraps until the day only seemed to heighten the anticipation, and a great time was had by all. If you are over 18 and would like join us for the next screening please ring Engadine library and book your seat.